Fusing elements of chamber and film music, storytelling and taonga puoro, this album has two poignant and well-loved historical narratives of the Te Arawa people. The two stories are set in a three-tiered musical narrative. The narration happens between musical interludes, at times over the music, while the taonga puoro tells the story using harmonic, melodic and improvised interactions with the chamber ensemble. 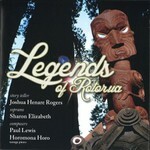 The third piece is an instrumental, Pink and White Terrraces, incorporating Western and Maori instruments.